Al Maya Group, a leading business conglomerate in the UAE, is keen to expand its products portfolio from Korea. Al Maya, the winner of Superbrand status for 2013, operates around 39 supermarkets in the UAE and Oman. Plans are afoot to open more supermarkets in Dubai, Abu Dhabi and other emirates, according to Mr. Vachani. Mr Seong-Doo discussed enhancing the business relations through Korean companies with Al Maya. Mr Kamal Vachani assured that the Group will promote Korean products through Al Maya Supermarkets. Mr Vachani, thanked H.E. 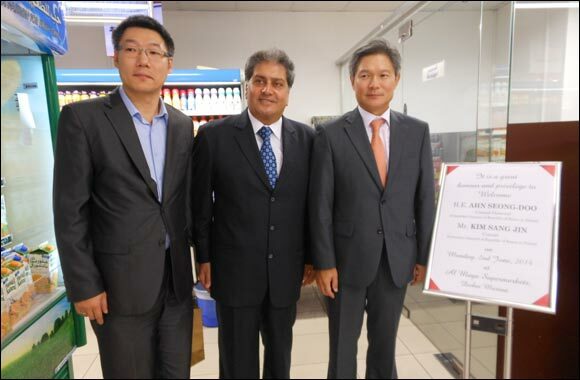 Mr AHN, Seong-Doo and Consul in their visit to Al Maya Supermarket.